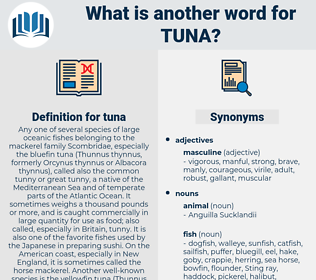 What is another word for tuna? Any one of several species of large oceanic fishes belonging to the mackerel family Scombridae, especially the bluefin tuna ( Thunnus thynnus, formerly Orcynus thynnus or Albacora thynnus), called also the common tunny or great tunny, a native of the Mediterranean Sea and of temperate parts of the Atlantic Ocean. It sometimes weighs a thousand pounds or more, and is caught commercially in large quantity for use as food; also called, especially in Britain, tunny. It is also one of the favorite fishes used by the Japanese in preparing sushi. On the American coast, especially in New England, it is sometimes called the horse mackerel. 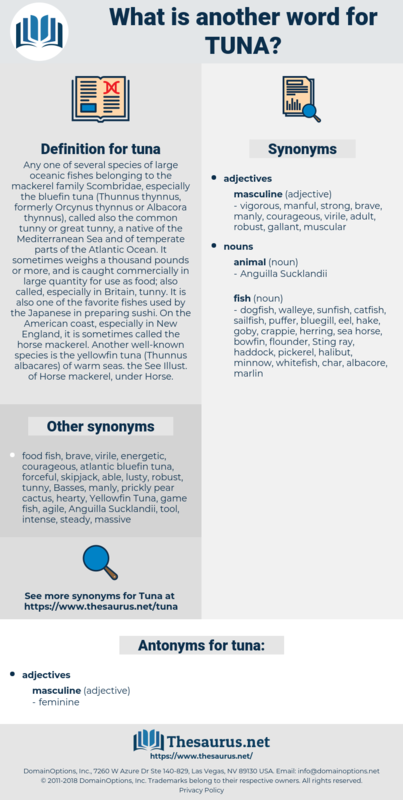 Another well-known species is the yellowfin tuna ( Thunnus albacares) of warm seas. the See Illust. of Horse mackerel, under Horse. prickly pear, prickly pear cactus.